What’s not to love about attacking a race track with a three-row SUV? It’s not every day that the launch of a new three-row SUV takes place at a race track. 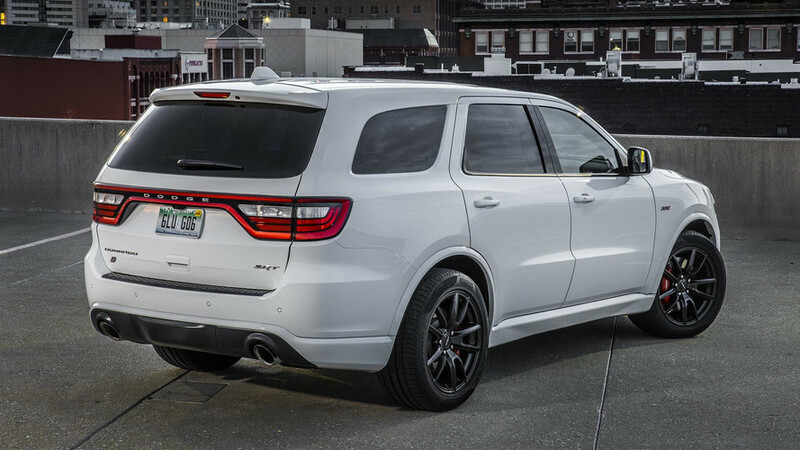 Then again, the Dodge Durango SRT is not like every other three-row SUV. 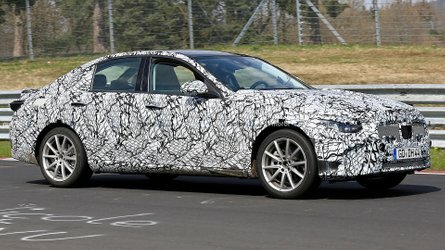 Think of it as a taller, more spacious Charger, brimming with muscle-car looks, power, and sound. Or, alternatively, as a Jeep Grand Cherokee SRT with an extra set of seats in the back. You get 475 hp and 470 lb-ft of torque, enough to get this 5,510-pound SUV to 60 mph in 4.4 seconds and through the quarter-mile in 12.9. The extra air ducts are not just for show, helping both extract heat from the engine bay and bring in cooler air for the intake. On a hot test day at Virginia International Raceway, engineers found that Durango SRTs with the cold-air inlet ducts lost about 0.3 seconds in lap times as the temperature rose during a test day; vehicles without those ducts lost 1.5 seconds. 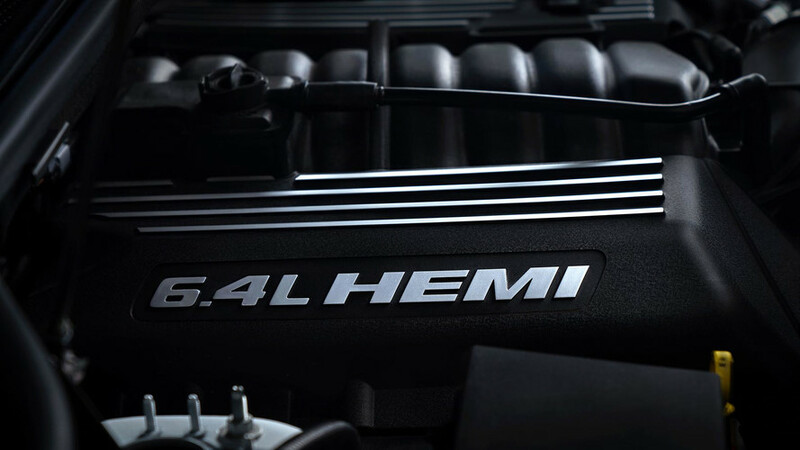 The engine in question is the 6.4-liter – that’s 392 cubic inches for traditionalists – V8 we know and love from other SRT products. Equipped with pushrods and port fuel injection, it’s not exactly the most modern engine in the Dodge stable, but it sure puts up big results. You get 475 horsepower and 470 pound-feet of torque, enough to get this 5,510-pound SUV to 60 miles per hour in 4.4 seconds and through the quarter-mile in 12.9 seconds. As expected, the engine rips and pulls, delivering punchy results in any gear at any speed. It sounds killer, too, roaring enough to overwhelm any conversations inside the cabin. It’s even more a treat to listen from the outside, where the snarls and snaps of the giant exhaust tips echo all around the grandstands at Indianapolis Motor Speedway. There’s tons of precision from the steering and more than enough grip from the wide 295/45ZR20 tires to pick an aggressive line through corners. 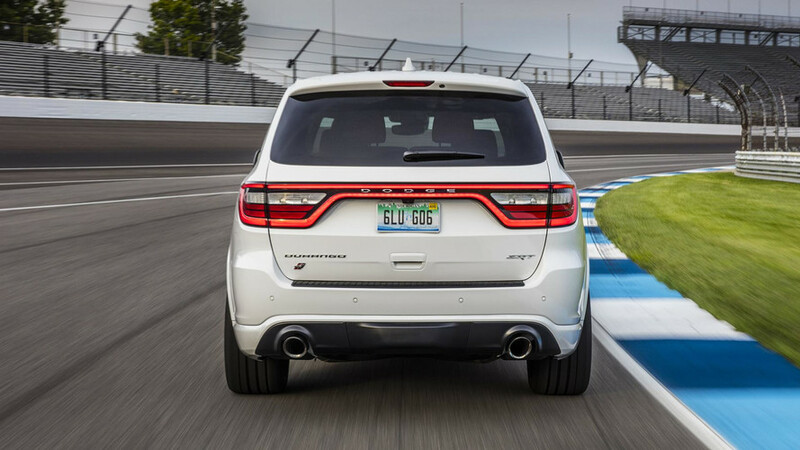 Back behind the wheel, though, the Durango SRT holds its own on IMS’s MotoGP circuit. 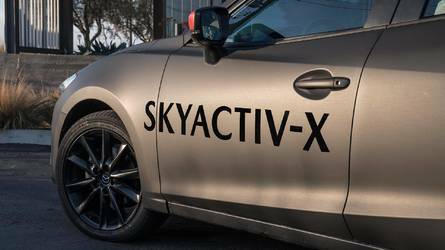 Suspension stiffening changes focused more on tightening up the rear end; the front spring rates are up 3 percent but the rears are 16-percent stiffer, while the rear anti-roll bar is stiffened by 18 percent. Couple that with the 30:70 front-rear all-wheel-drive torque split when you switch to the Track driving mode, and the SRT turns into corners eagerly. There’s tons of precision from the steering and more than enough grip from the wide 295/45ZR20 tires to pick an aggressive line through corners. 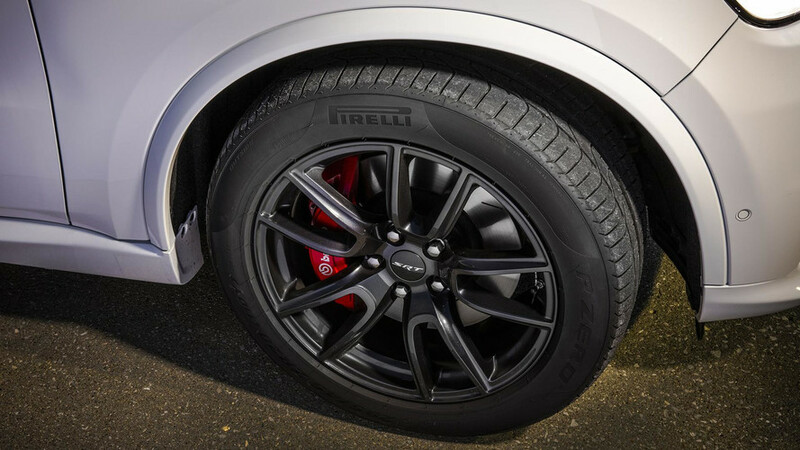 The adaptive dampers, set to their firmest setting in Track mode, keep body motions reasonably well in check, too. Dodge has chopped up the MotoGP track a bit with cones and chicanes to keep speeds somewhat reasonable, but I still crest 100 mph before reaching the braking zone on the front stretch. Despite somewhat lengthy initial pedal travel, braking force quickly ramps up to slow the car handily. Up front are six-piston Brembos clamping 15.0-inch rotors, with 13.8-inch rotors on the rear axle. 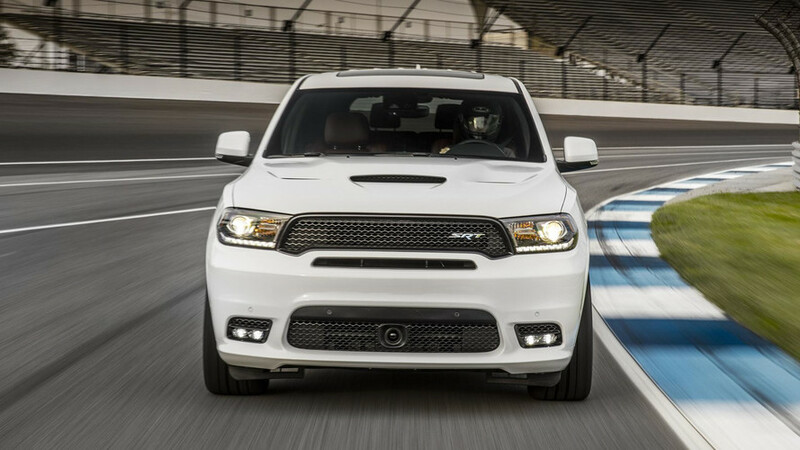 The bottom line is that the Durango SRT can set a swift pace around a race track. It’s forgiving and friendly to drive here, plenty fun, and as exciting to listen to as any muscle car. 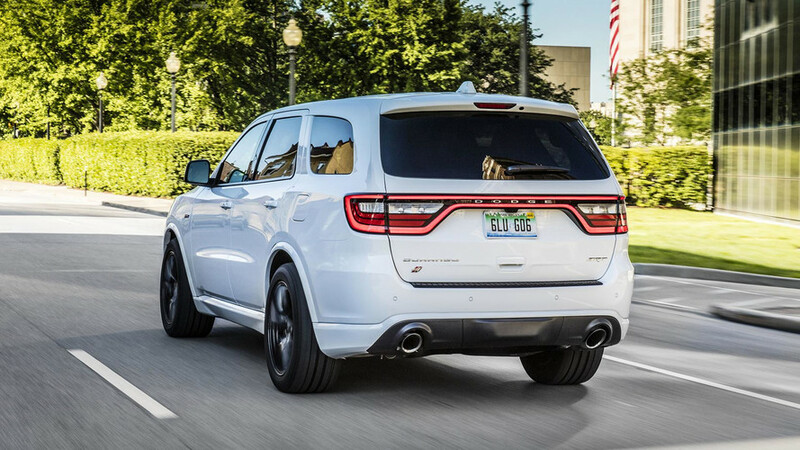 Still, not many buyers will spend much time at race tracks – although Dodge will gift any Durango SRT customer a free day of driving instruction at the Bob Bondurant school. For all the “sport” added to this sport utility vehicle, not an ounce of utility has been lost. Just as much fun can be had, however, on public roads. I dial back the drive-mode switch to Auto to soften ride quality somewhat, then romp on the throttle and dig into twisting country roads outside Indianapolis. 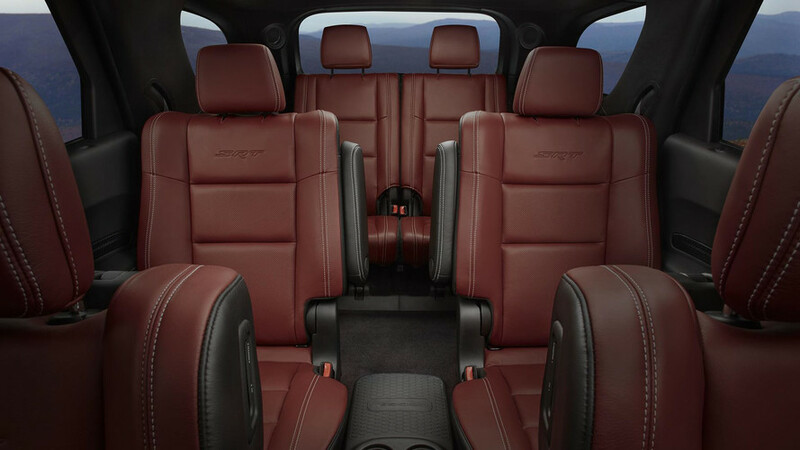 Alternatively, you can lean back into the plush seats and simply enjoy driving the SRT like any other Durango, fingers wrapped around the flat-bottom steering wheel, ogling the various SRT badges and 180-mph speedometer while using this hot Dodge SUV just like any other daily driver. Cargo room is also unaffected, with 17.2 cubic feet available with all three rows in use, and 84.5 cubic feet if you lower the second and third rows. The rear rows of seats are capacious; with captain’s chairs in the second, you’ll only fit six occupants total, but that’s still more people than can squeeze into a Charger or Challenger SRT. Cargo room is also unaffected, with 17.2 cubic feet available with all three rows in use, and 84.5 cubic feet if you lower the second and third rows. 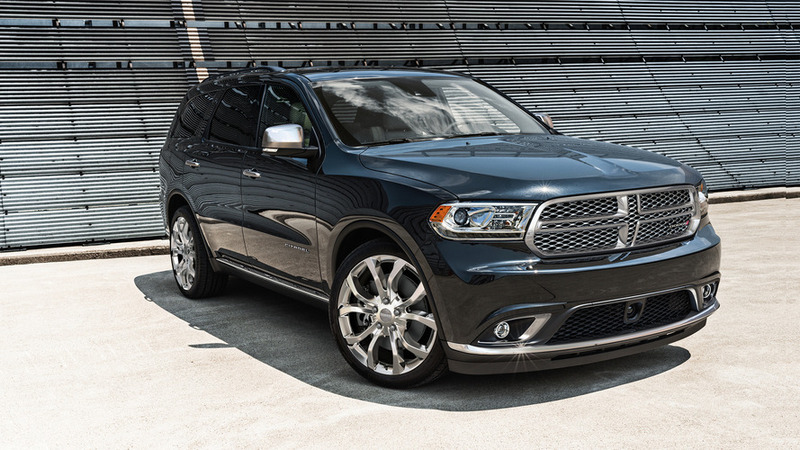 Nor does the SRT offer any fewer features than other Durango versions. 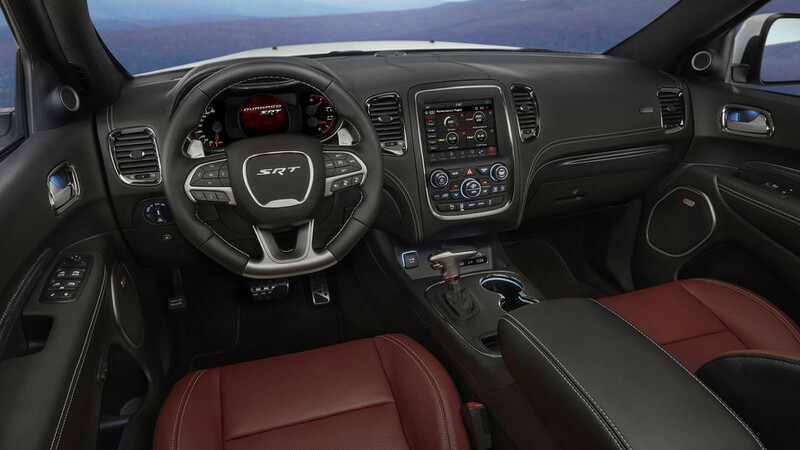 Standard SRT features include heated and cooled power front seats, heated second-row seats, a seven-inch color trip computer, an 8.4-inch touchscreen with Android Auto and Apple CarPlay, and a 506-watt BeatsAudio system. Options include all-season tires instead of summer ones, rear-seat entertainment screens, a power sunroof, ultra-cool Demonic Red Laguna leather upholstery, and carbon-fiber trim. Downsides are relatively few. 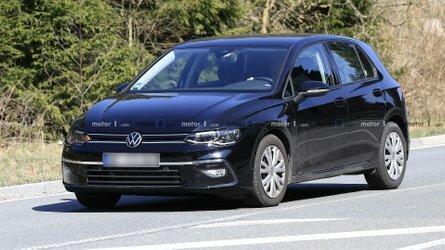 Overzealous throttle tip-in hinders gentle starts, even in the default Auto drive mode. The burbling exhaust continues burbling at all speeds, too. And, perhaps unsurprisingly, fuel economy is not great. Though official EPA estimates aren’t available yet, I saw 11.5 mpg on the trip computer after an hour’s drive. And the standard BeatsAudio system is all about that bass but less great with mids and treble. As well as Track and Auto, the Durango SRT has Snow, Sport, Tow, and Eco driving modes. 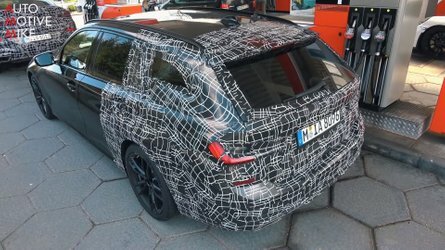 The former forces second-gear starts and locks the all-wheel-drive system’s torque split at 50:50, Sport mode is a midway point between Auto and Track, and Eco relaxes the throttle and shift mapping. 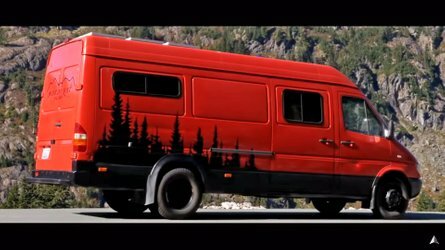 Tow mode switches on trailer-sway control, and also uses the active noise cancellation system to help prevent any unpleasant droning. 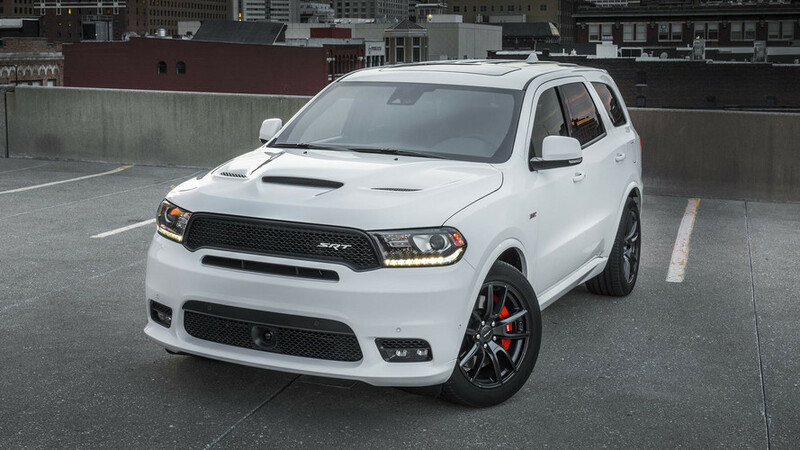 This go-fast Durango is for the driver who wants muscle-car fun without having to sacrifice everyday utility. The final drive mode is Valet, which re-tunes the engine’s output to mimic the exact horsepower and torque output curves of the Durango’s base V6 engine, while also preventing drivers from disabling stability control or trying launch control. This feature could probably also be called “teenage driver” mode. At $62,995 before destination or options, the SRT is the costliest Durango trim by a big margin (the 2017 R/T AWD lists for $44,695). On the other hand, it does comes with lots of standard goodies, and it undercuts the very similar Jeep Grand Cherokee SRT ($66,895). And, again, you’re paying partly for the ability to do pretty much everything from towing to foul-weather driving to daily commuting to track days. 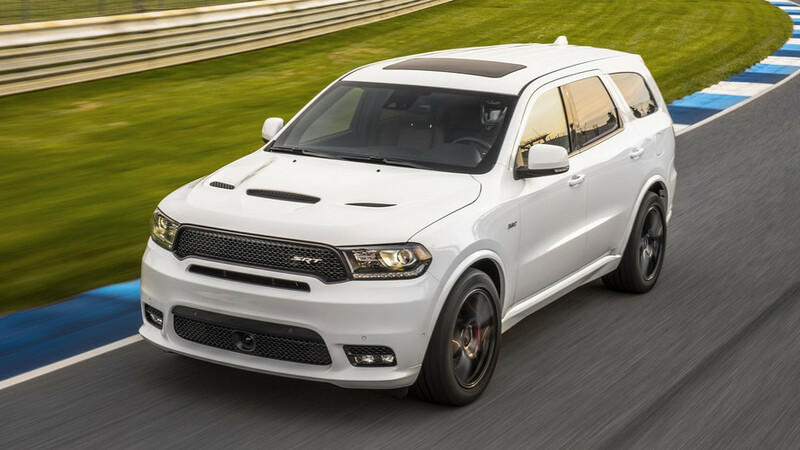 The introduction of the Durango SRT is a natural progression for Dodge, which is gradually spreading performance parts across its entire lineup. Less extreme but far more useful than the the Challenger SRT Demon, this go-fast Durango is for the driver who wants muscle-car fun without having to sacrifice everyday utility.